I should be finalizing a trip to Mexico about now. We usually plan a getaway for spring break, as my daughter has such a full school schedule, it’s difficult to do otherwise. But, since we opted to do so much to the house this past year instead, (Yay, I have an office! And I love it.) we are staying closer to home. And enjoying the improvements. And spring weather. And yummy, tropical-tasting smoothies, which is almost as good as having them at the beach. They are certainly healthier, even if my view is of the mountains instead of the ocean. I can’t complain. 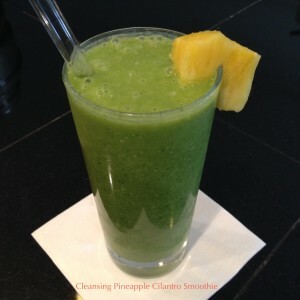 This is a wonderful smoothie for spring. It’s green, but sweet, and a little tangy. Did I mention healthy? It’s so full of live enzymes and nutrients your cells will be dancing. A quick rundown on the benefits: Pineapple is full of digestive enzymes, so this makes an easy-to digest, healthy treat. Since it’s in a base of super-hydrating coconut water, it is like getting Gatorade, without all of the nasty chemicals. The coconut meat adds healthy saturated fat, which is actually fat-burning, as well as lauric acid, which destroys viruses and bad bacteria. Cilantro is very chelating, meaning it pulls out metal and toxins. The kale adds tons of Vitamins A, C, and K, and is high in minerals. So start chopping! You will need a high-speed blender to liquify the kale, but if you don’t have one, just realize it may be a bit chewy. You could also substitute powdered greens instead. Optional: You could also add in a few tablespoons of protein powder if you like. Just put all ingredients in your blender, and enjoy. If you are only drinking half, just put the rest in a mason jar and store in your fridge. For maximum nutrition, drinking it within 24 hours is best. You may also want to add to the blender with a bit more ice to revive the texture.